After ten rounds of qualifying games, the Trophy final for the Masterton Midwinter Doubles featured two teams vying for their second title. 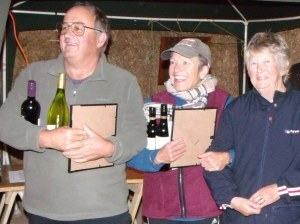 At the end of play, it was the 2002 champions, Denise Bavidge and Geoff Greer, who prevailed 13-9 against 2009 champions, Andrew Joe and Brian Smith. Please find attached a notice advertising the Annual General Meeting of the WPA. Nominations for the positions of President, Secretary and Treasurer are now required. Just a reminder that the incumbent President is not seeking re-election, so a new President will need to be found. A copy of the minutes of the previous AGM is also attached. Please ensure all of your Club members receive this notice so we may have a good attendance. Attached please find a memo from Dirk Winnie, who was elected as PNZ President at the May Board meeting, and notes from that meeting, plus the minutes of the 2012 AGM for you to bring to the attention of your Club members. Voting for the Personality of the Year has now closed. The Award winners will be announced at the WPA AGM on Saturday 14 July. Kapiti successfully defended the Jacques Cochonnet in their away match to Horowhenua. Triples: Max Brown/Fay Doyle/Annick Le Guen vs. Carleen Fitzgerald/Francis Johns/Shirley MacDonald 13-7, 7-13, 13-6. Kapiti's next defence is away to Upper Hutt. The Sixth Pan Pacific Championship is being held at the Floreal Pétanque Club in Sydney. Eight nations are represented: Australia, Brunei, Indonesia, Japan, New Caledonia, New Zealand, Singapore and Thailand. In this morning's first round, the NZ Men team beat Japan, while the Women's team beat Brunei. Christine Strichen is through to the semi-finals in the Shooting competition. Christian Fouquet, David Lippard, Andre Noel, Georgio Vakauta and John Targett (coach). Sharon Cannon, Joanne Lippard, Christine Strichen, Claire Wilson and Dirk Winnie (coach). Christine Strichen won the Silver Medal in the Shooting competition. The Gold medal was won by a member of the Thailand Women's team. Scores not yet available. This may be the first time that a Open Shooting competition featured two women in the final. In the games, both NZ teams have qualified for the top 8. The men face Australia 1 and the women face Singapore. NZ Men's team reach the semi-finals after defeating Australia 13-3. NZ Women go down 12-13 to Singapore. New Zealand vs. Thailand, New Caledonia vs. Singapore. Thailand wins the semi-final 13-10. New Caledonia beat Thailand 13-1 in the final. PNZ has confirmed the members of the NZ team to the 2012 World Championships in Marseille, France. The team is: Christian Fouquet (Herne Bay), David Lippard (Herne Bay), Andre Noel (Vikings), and Georgio Vakauta (Vikings). The Team Coach is John Targett (Christchurch) and the Team Manager is Lorraine Brock (Kennedy Park). The competition is from 4 to 7 October. Brian Frampton (Kapiti), Sue Gurr (Wanganui East), Richard Lawson (Hataitai), Shirley MacDonald (Horowhenua), Bob McCarthy (Otaki), Margaret Mordecai (Otaki). A practice will be held at Otaki Pétanque club on Saturday 14 July at 11:00 am. Francoise Case (Herne Bay), Margaret Maher (Northcote), Jean Parley (Stanley Bay), Bill Peachey (Hibiscus Coast), Margaret Penny (Herne Bay), Ray Pierce (Herne Bay).